The mind is a terrible thing to waste. 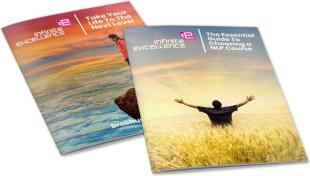 Our 4-in-1 NLP Master Practitioner course will help ensure you ALWAYS make the most of yours! Take your skills and excellence to the next level. Become a Master Practitioner of NLP and Time Line Therapy™, a Master Hypnotist and NLP Master Coach. Book now! 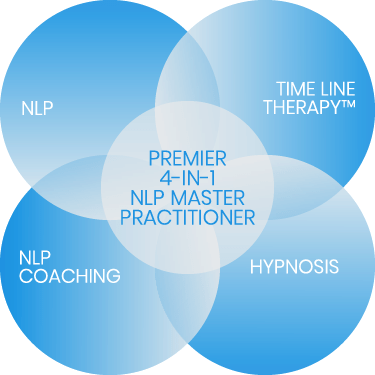 Why Take Our 4-in-1 NLP Master Practitioner Course? With our 4-in-1 NLP Master Practitioner Course you can learn how to achieve these and more. The NLP Master Practitioner Certification builds on your NLP Practitioner skills to give you some of the most effective language patterns and techniques for quick and effective change, increased and consistent performance and business results. Understand yourself and others at a whole new level and know how to achieve excellent results in any context including coaching, managing and sales. The Time Line Therapy™ Master Practitioner Certification gives you the processes to let go of those problems which hold you or your clients back, access powerful internal resources and attain optimum health and well-being. Combined with the other modules gain the ultimate coaching tool kit and frameworks for long-term results for yourself or your Coaching clients. he Master Hypnotherapist Certification shows you advanced techniques to create and support change with the ancient and respected art of Hypnosis. Deepen your knowledge of the unconscious mind and what is possible with trance to gain even more flexibility and effectiveness when using Hypnosis on it’s own or in an integrated coaching process for maximum results. NLP Master Coach Certification provides an advanced framework of tools, techniques and thinking to assist you and others achieve success. With forward-thinking language patterns, business tailored tools and some of the most revolutionary Values and motivational work ever this certification gives you the edge as a world class Coach in the work place or with your own Clients. The course is 14 continuous days, including 1 day off. Before attending the course you will receive a comprehensive multimedia pack, which will be your pre-course study material. Completing the pre-study work means that time in class is focused on practicing and fine tuning your skills – assuring that you leave certified and confident in your skills and abilities. Discover the most unconscious filters to our perception and how they determine our behaviour and personality. Learn how to utilise knowledge of these in personal and professional contexts. Learn the trade secrets of effective training design and how to apply these to any training or presentation so that you can communicate effectively with all personality types and gain maximum results. Learn the keystone of NLP and become excellent in anything you want to put your mind to! The course includes the completion of a full 8 hour personal breakthrough session with one of your fellow students, who will be your first official client! You will work with them to rid them of blockages and set powerful goals for the future. Go home with your first testimonial on how masterful you are at NLP, Time Line Therapy™, hypnosis and NLP Coaching! For anyone wanting to take their coaching, mentoring or guiding of others to another level and discover an advanced integrated framework of tools, techniques and thinking to assist others to success. This NLP Coaching level truly facilitates the unlocking of an individual’s potential for achieving sustainable results. This certification is a natural fit with all our other areas of training. A framework to facilitate advanced levels of change that can be applied to any area: business, therapy, education, sports and much more……….